At almost 5,000 feet elevation in the Andean foothills, the Adrianna vineyard's calcareous soils and cool climate are the promised land of Chardonnay. The fruit from the Adrianna vineyard has a purity of flavors and a minerality that is particular to this vineyard and can not be found anywhere else in Mendoza. The nearby, gravel-covered Domingo Vineyard makes up 20% of the blend. Elevage: 14 months in French oak barrels. Whole clusters are pressed, and then 100% fermented in 500 L French oak barrels with natural yeasts at low temperatures. Wild yeasts. Aged for 14 months in French oak. 30% does not undergo malolactic fermentation. First, second and third use barrels used. Adrianna Vineyard: 4,757 ft (1,450 m). Gualtallary District, Tupungato Region, Uco Valley, Mendoza, Argentina. Alluvial, gravelly with limestone deposits in the topsoil. Lot 1. Domingo Vineyard: 3,675 ft (1,120 m). Surface is completely covered with gravel. Alluvial topsoil is loamy with limestone deposits at 11,8 inches (30cm). Plant selection: Dijon Clones and Selección Mendoza. Lot 7. 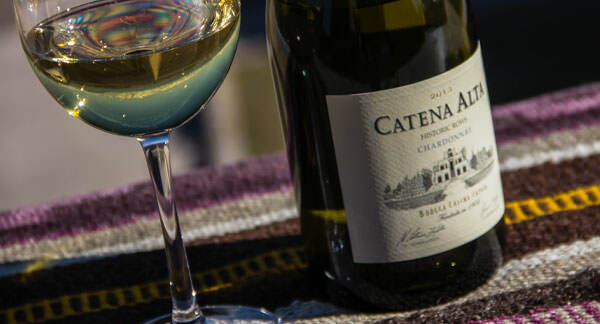 Catena Alta is an assemblage of historic rows within the Catena family State vineyards. The blend of these historic rows, like the combination of sounds that create a symphony, gives us highly aromatic and elegant wine that speaks for the terroir and the vines that have been tended by the four generations of the Catena Family. "Alta" means high in Spanish. This makes reference to the high altitude vineyards from where the grapes are sourced, and to the high end wines that are produced with this special grapes.